Ever wanted to add a form to your WordPress site? A basic requirement of almost all websites, no matter their purpose, is a contact form that enables customers or potential customers to complete a few basic fields to send an enquiry through. Sometimes you will also need more complex forms that request multiple types of data from a user. If you have ever wanted to create a custom form on a WordPress site you will know that there are a lot of plugins to choose from. As web developers, we have tested a lot of different form plugins, including Contact Form 7, Gravity Forms and WPForms. Our personal favourite, however, is Ninja Forms. A lot of the form builder plugins available are overly complicated as they have a lot of features included that you will probably never need. And of course, there is often a cost associated with a fully-featured plugin. The great thing about Ninja Forms is that the base plugin is free and does everything that the majority of users need from a form plugin. Then, if there are additional elements of functionality that you need, you can purchase extensions. The only downside that we’ve found to using Ninja Forms, is that all of the aspects of the functionality are available only to WordPress users whose accounts are set with the user role of ‘Administrator’. To help keep sites as secure as possible, we avoid having more than one user set as an ‘Administrator’, with the day to day users set to ‘Editor’ or other levels, sometimes including custom roles. Unfortunately, this results in the day to day users having no access to any of the Ninja Forms abilities – so they are unable to create new forms, edit existing forms or even view form submissions. We found that on client websites we developed, we were having to customise this setup to enable these types of users to access the Ninja Forms functionality – otherwise, they would need to have ‘Administrator’ level accounts, or ask us to make changes to the forms on their behalf, somewhat negating the point of having a content management system (CMS). With this issue cropping up on all developments where we were using Ninja Forms, and having to customise the setup using a small custom plugin, we decided to expand upon the plugin code further to develop a full, comprehensive open source plugin that enables users to quickly and easily set which aspects of the Ninja Forms functionality each user role has access to. Using Permissions Editor for Ninja Forms is easy – simply download and install the plugin from the WordPress Plugin Directory, After installing and activating the plugin, you will see a new link situated in the ‘Settings’ menu drop-down. 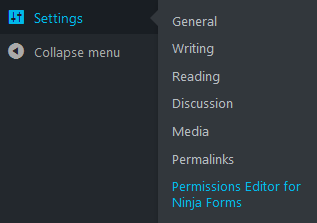 Clicking on this will then present you with the Permission Editor for Ninja Forms user permissions matrix where you can pick and choose permissions for individual user types. And it is as simple as that – you can now add and remove permissions to the different user types. We hope to create more WordPress plugins in the near future so watch this space. Do you have a requirement for a bespoke WordPress plugin to add functionality to your website? Contact the Rapid Web team on our website or give us a call on 01785 250 222.